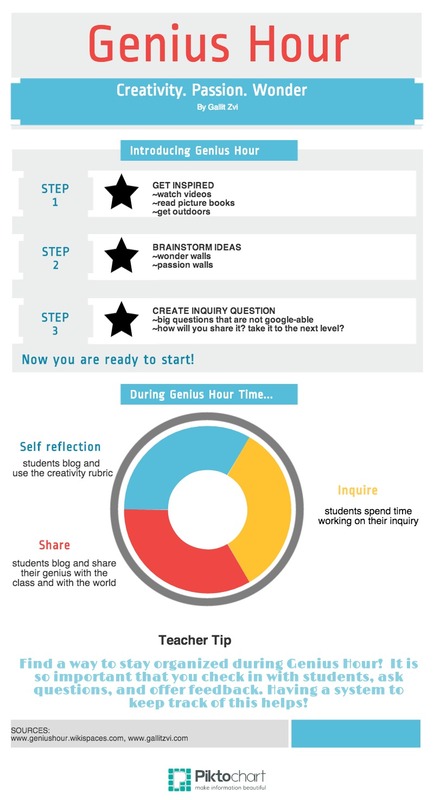 If you’ve been exploring our book website, by now you have heard all about why you should give your students a weekly Genius Hour. We hope you are beginning to see the amazing potential of such a project and you are ready to dive in. But how do you get students started? In Chapter 3 of our book we go into this question in some detail. Here, I’ve created an infographic that will summarize for you the 3 Steps approach that we recommend. In the poster, the self-reflection segment mentions the “creativity rubric,” so we’ve included a download link for that at the end. Keep in mind what Parker J. Palmer says, “Good teaching cannot be reduced to technique; good teaching comes from the identity and integrity of the teacher” (The Courage to Teach). As educators, you will have to do it your way and make it your own, but these steps are the tried, tested and true ways that have worked for us and many others.